The San Jose Blog: Downtown San Jose Treasure Hunt on Aug 25th! Downtown San Jose Treasure Hunt on Aug 25th! Are you looking for something really cool to do over the weekend? 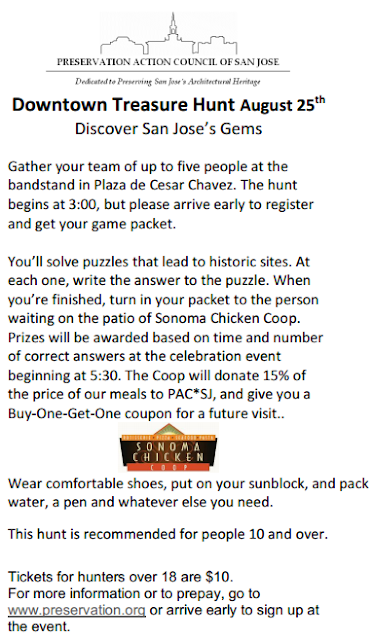 The Preservation Action Council of San Jose (PAC*SJ) is hosting a Downtown Treasure Hunt at 3pm this Sunday! This organization's goal is to preserve the architectural heritage in San Jose as well as promote development that keeps the city vibrant. Part of the proceeds from this event will help support PAC*SJ. The hunt starts at Plaza de Cesar Chavez where participants will have to follow clues which will lead them to some of the most interesting historic buildings in the area. The hunt ends in Sonoma Chicken Coop and there will be small prizes for the winning teams. The Treasure Hunt is free for kids and teens and $10 for adults. For more information on PAC*SJ, head over to their website over here. More information on the event is below!